Knoop, M., Marzoli, I., Morigi, G.
189 of Proceedings of the International School of Physics "Enrico Fermi"
Ion trapping was first accomplished in Europe more than 50 years ago. Since then, research and development have increased steadily, and the last decades have seen a remarkable growth in applications, mainly due to the improvement of laser-based techniques for spectroscopy, cooling and the manipulation of ions. Nowadays ion trapping plays a crucial role in a wide range of disciplines, including atomic and plasma physics, chemistry, high precision measurement, high energy physics and the emerging field of quantum technologies. 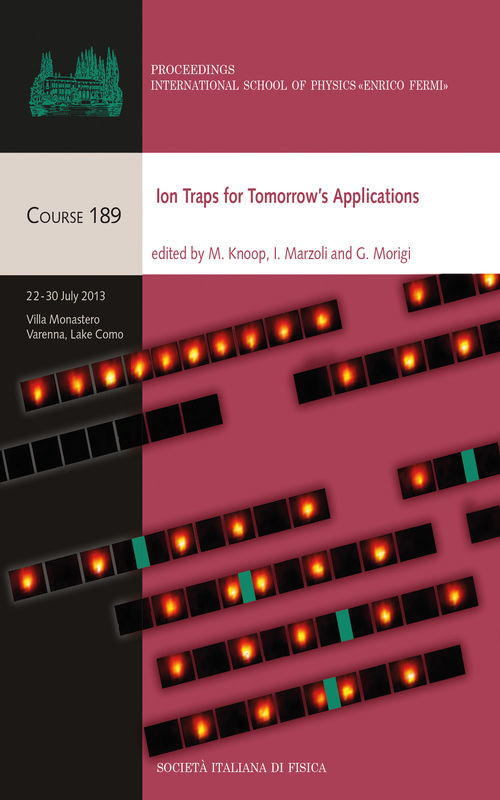 This book presents lectures and reports from the Enrico Fermi School ‘Ion Traps for Tomorrow's Applications’, held in Varenna, Italy, in July 2013. Reflecting the aim of the school to exploit diversity and stimulate cross fertilization, the selected topics and highlights in this book partly review the wide range of subjects discussed during the course, while providing an overview of this topical domain. As well as providing a useful reference guide, the book will be a source of inspiration for all those planning to work on ion trapping in the future.